P.S. You’re Interesting is a series of conversations on political science research hosted by Jeffery A. Jenkins. Formerly, “Our American Discourse,” we continue the series to pick up the tradition Anthony W. Orlando began. We hope to keep conversations … discourse alive. To keep thinking about the research we do in the academy, why it matters to us, and hopefully to you. 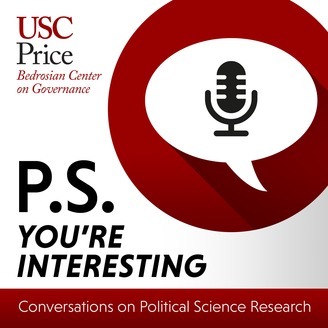 Sponsored by the USC Bedrosian Center http://bedrosian.usc.edu/ Recorded at the USC Sol Price School of Public Policy http://priceschool.usc.edu. 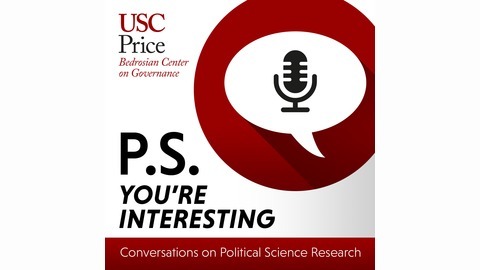 In this episode of the PS You’re Interesting podcast, Jeff Jenkins's guest is Elisabeth R. Gerber, Associate Dean for Research and Policy Engagement; Jack L. Walker, Jr. Collegiate Professor of Public Policy (UMich). They discuss the move from Political Science departments to public policy departments - how the focus has moved from theory development to theory application, and how engagement with community stakeholders outside of the university can help solve real world problems. Plus they look at some of the other questions Gerber asks in her research ... including her interest in the future of work.